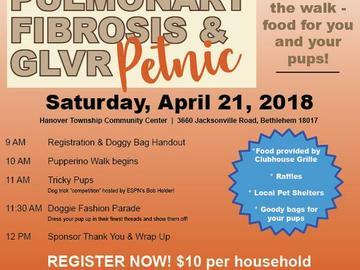 The Pups for Pulmonary Fibrosis and Petnic is a NEW, UNIQUE event for you, your pup friends and for a heartfelt cause! Come join us as we take a stroll with your Pup(s) throughout beautiful Hanover Township Park! We will be having vendors from all over the area who love and care for pets as much as YOU do! Pet rescues, foster care, healthy food and a whole lotta love! Pups for Pulmonary Fibrosis benefits Wescoe Foundation for Pulmonary Fibrosis, a 501(c)3, non-profit organization that provides support, advocacy and resources for patient and their families living with Idiopathic Pulmonary (IPF) in order to sustain the highest possible quality of life. Learn more about our story, our support groups, education programs and resources at https://wescoefoundationforpulmonaryfibrosis.org/. Thank you so much for all of your support as we support the pulmonary fibrosis community living with this rare, incurable lung disease.